There are plenty of wild animal Christmas ornaments available if you’re thinking of doing a wildlife themed Christmas tree this year. They are beautiful too! Wildlife Christmas ornaments not only look great on your tree but they make nice little gifts as well. Do you know someone who just loves moose or tigers? We have cute bears, whimsical birds, and a hippo too, just in case you wanted a hippopotamus for Christmas. The call of the wild. That saying is epitomized by the howling wolf ornament pictured here. What a great addition to a collection of wildlife Christmas ornaments. This wolf ornament is mouth blown glass, done in the old world European traditional style. It is accented with glitter and measures 3.5 inches tall. The incredible diversity of wild animals on this planet is pretty amazing. The big bulky hippo, at one time called a river horse, is so totally different from the long necked giraffe. The koala, gorilla, and moose, each totally unique and each perfectly suited and specialized for their own environment. Each of the world’s ecosystems has its own set of wildlife. Africa has a big tourism industry centered around their unusual wildlife. Bring the wild into your home with these lovely depictions of favorite wild animals. The Old World style of making ornaments results in a luminous product due to the addition of liquid silver in the process. 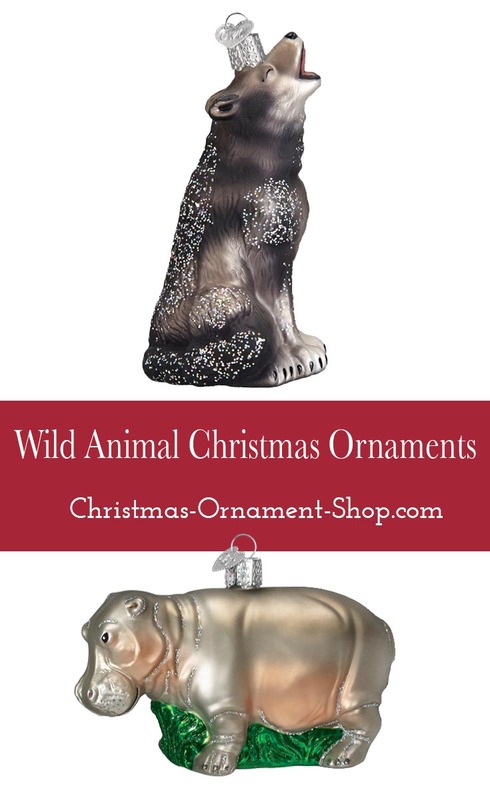 Add some wild animal Christmas ornaments this year.